Manuscript format must be in accordance with the ICMJE-Recommendations for the Conduct, Reporting, Editing and Publication of Scholarly Work in Medical Journals (updated in December 2015 - http://www.icmje.org/icmje-recommendations.pdf). Manuscripts that do not comply with the rules of the Journal will be returned to the author for correction without further review. Therefore, to avoid loss of time and work, authors must carefully review the submission rules. The journal evaluates only the manuscripts submitted through its online submission system on the web site http://kocaelimj.org/jvi.aspx. Manuscripts sent by other means will not be accepted. Our journal's mission is to publish articles that are scientifically, technically, and ethically valid. A manuscript's novelty, originality, or potential for impact is not a consideration for publication. 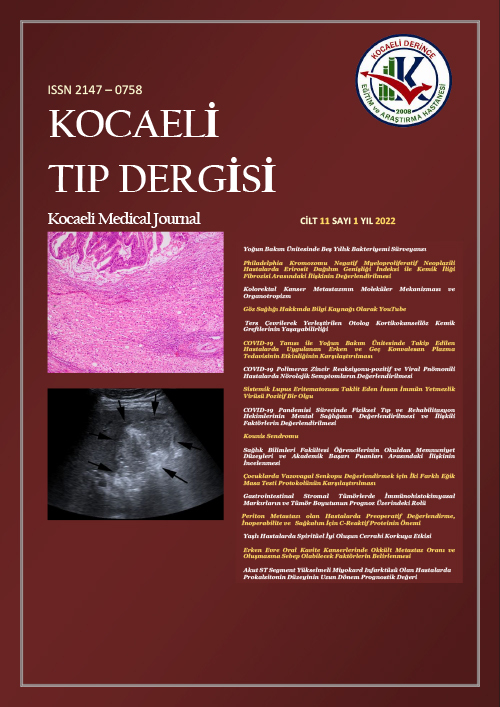 All contents and opinions expressed in the manuscripts published in the Kocaeli Medical Journal reflect the views of the author(s). All liability for the advertisements rests with the appropriate organization(s). The University of Health Sciences, Kocaeli Derince Training and Research Hospital and the Editor-in-Chief do not accept any responsibility for articles and advertisements. All manuscripts submitted to the journal should not have been accepted and published previously elsewhere in electronic or printed format even though the previous one was published in a different language. Authors who aim to send a manuscripts evaluated and rejected by other journals should indicate previous Editor’s and reviewer’s reports to accelerate the evaluation process. If the submitted manuscript has been previously presented at a meeting, the name, date, city and country must be specified in Cover letter. At the beginning of evalutaion process, the authors must transfer all copyrights of the manuscript in the framework of national and international regulations to the University of Health Sciences, Kocaeli Derince Training and Research Hospital. A Copyright Transfer Form signed by corresponding author in order must be submitted to the journal with manuscript. At the end of evaluation process, if manuscript accept for publication, all of authors must fill and sign Copyright Transfer Form. A separate form for each manuscript should be submitted. Authors must submit a cover letter with their manuscript which should include the title of their manuscript and the type of manuscript it is (e.g. review, research, case study). Then, briefly explain the background to their study, the question they sought out to answer and why. Also they must confirm that they will not submit the work to another journal, publish it in the original or another language and or allow a third party to use the manuscript without the written permission of the University of Health Sciences, Kocaeli Derince Training and Research Hospital. All financial liability and legal responsibility associated with the copyright of submitted tables, figures and other visual materials protected by national and international laws rest with the authors. The authors take responsibility for any legal proceedings issued against the journal. Rejected manuscripts will not be returned to the authors. The Medical Journal of Kocaeli will publish article across all medical disciplines. Authors are encouraged to submit their original work related to all disciplines of dentistry and nursing, with prime focus being on the clinical or experimental research studies. Case reports, either in form of single case or case series, are also welcome provided that they describe unusual presentation of a rare entity or a different treatment approach. Review articles will be considered if they deal with controversial topics and provide a clear synthesis of previously published data. The articles in related to dentistry and nursing will be published in a supplement of the journal once a year. The format of the manuscripts must be in accordance with the ICMJE Recommendations for the Conduct, Reporting, Editing and Publication of Scholarly Work in Medical Journals (updated in December 2014:http://www.icmje.org/icmje-recommendations.pdf). The presentation of the manuscripts must be in accordance with international guidelines. CONSORT should be used for randomized trials, STROBE for observational studies, STARD for diagnostic studies, PRISMA for systematic reviews and meta-analyses, ARRIVE for animal studies, and TREND for non-randomized behavior and public health studies. All manuscripts will be checked by the Managing Editor for possible plagiarism and duplication. If there is any ethical concern, Managing Editor will inform the Editor-in-Chief and then, the Editor-in-Chief will give an oppurtunity to explain whether plagiarism or other misconduct is an honest error. However, if the response from author is unsatisfactory and intentional misconduct cannot be ruled out, the manuscript will be rejected if it is under the process of review. However, if the article is already published, then it is retracted with a notice published in the next issue. The author’s institution will be informed of the misconduct and the journal reply to the academic institution to take action. The journal will not accept any manuscript from the same person. The authors should acknowledge and provide detailed information on any contributions in kind and financial support given by any foundations, institutions and firms. Manuscripts reporting the results of experimental studies must explain in detail all procedures which volunteer subjects and patients have undergone and a statement indicating that consent for the study has been obtained from all subjects should be included in the text. Animal studies should clearly specify how pain or discomfort has been relieved. In addition and as stated above, for studies conducted on human participants you must state clearly that you obtained written informed consent from the study participants; please also look at the latest version of the Declaration of Helsinki. If ethics clearance was not necessary, or if there was any deviation from these standard ethical requests, please state why it was not required. Please note that the editors may ask you to provide evidence of ethical approval. If you have approval from a National Drug Agency (or similar) please state this and provide details, this can be particularly useful when discussing the use of unlicensed drugs. Manuscript files should be prepared with Microsoft Office Word and uploaded by using the online submission system of journal. The journal is a double-blinded peer reviewed journal. Thus, information about the authors and their institutions should not be included in the main text, tables, figures and video documents. Information about the manuscript as specified below should be included on the title page. For each type of manuscript, it is mandatory to upload a title page as a separate Microsoft Word document through the online submission system. The title page should include the names of the authors with their latest academic degrees, and the name of the department and institution, city and country where the study was conducted. If the study was conducted in several institutions, the affiliation of each author must be specified with numbers. The correspondence address should contain the full name of the corresponding author, postal and e-mail addresses, phone and fax numbers. If the content of the manuscript has been presented before, the name, date and place of the meeting must be noted. Disclosure of conflict of interest, institutional and financial support, author contributions and acknowledgments should be included on the title page. The manuscript should be typed in a Microsoft Word™ file, single-column format, double-spaced with 2.5 cm margins on each side, and 11-point type in Times New Roman font. All abbreviations in the text must be defined the first time they are used (both in the abstract and the main text), and the abbreviations should be displayed in parentheses after the definition. Abbreviations should be limited to those defined in the AMA Manual of Style, current edition. Authors should avoid abbreviations in the title and abstract and limit their use in the main text. Decimal points should be used in decimals throughout the manuscript. Measurements should be reported using the metric system according to the International System of Units (SI). Consult the SI Unit Conversion Guide, New England Journal of Medicine Books, 1992. When a drug, product, hardware, or software mentioned within the main text product information, including the name of the product, producer of the product, city of the company and the country of the company should be provided in parenthesis in the following format: “Discovery St PET/CT scanner (General Electric, Milwaukee, WI, USA). The manuscripts submitted to our journal must be classified according to the manuscript types stated below. During editorial evaluation, the maneging editor assess whether a manuscript’s format and sub-headings are prepared in accordance with the journal’s guidelines. Manuscripts that do not fulfill the writing rules and requirements are sent back to the authors at this stage. Main Text: It should consist of Introduction, Methods, Results, Discussion, Limitations of the Study and Conclusion sections. -Introduction: This section should be succinct, with no subheadings. -Materials and Methods: This part should contain sufficient detail that would enable all procedures to be repeated. It can be divided into subsections if several methods are described. -Results: This section should contain main results of the study. -Discussion: This section may be divided into subsections or may be combined. In this section authors should discuss main results of the study and compare them with the relevant literature. Maximum length: 5000 words of text (not including abstract, tables, figures, references, and online-only material). -Conclusions: This section should be included in the discussion section and should clearly explain the main conclusions of the article, highlighting its importance and relevance. Tables: All tables should be submitted as seperate files and in Word format. Tables should be cited consecutively in the text. Every table must have a descriptive title and if numerical measurements are given, the units should be included in the column heading. Figure legends: They should be placed below the reference list and numbered according to their consecutive order in the main text. Figures and Images: They should be provided after the reference list according to their order of appearance in the text and should be limited to ten. For manuscripts in English submitted by Turkish authors or from Turkey, Title, Structured Abstract and Keywords should also be provided in Turkish. However, translations of these sections for manuscripts submitted by foreign authors outside Turkey will be the responsibility of the Journal. Statistical Analysis: Statistical analysis should be conducted in accordance with the guidelines on reporting statistical data in medical journals [Altman DG, Gore SM, Gardner MJ, Pocock SJ. Statistical guidelines for contributors to medical journals. Br Med J 1983: 7; 1489-93 and Lang T, Altman D]. The software used for statistical analysis must be described. Data must be expressed as mean ± standard deviation when parametric tests are used to compare continuous variables. For non-parametric tests, data must be expressed as median (minimum-maximum) or percentiles (25th and 75th percentiles). In advanced and complex statistical analyses, relative risk (RR), odds ratio (OR) and hazard ratio (HR) must be supported by confidence intervals and p values. Brief reports are short and peer-reviewed articles including small case series, negative trials, the preliminary results and others that are not to be published as a full text paper. Main Text: It should consist of Introduction, Methods, Results, Discussion, Limitations of the Study and Conclusion sections. The main text should be less than 2000 words with a maximum 20 references. Figures and Images: They should be provided after the reference list according to their order of appearance in the text and should be limited to four. Authors are selected and invited by the Editors. This type of manuscript aims at providing a brief commentary on an article published in the journal by a researcher who is an authority in the relevant field or by the reviewer of the article. Main Text: It should not include subheadings and should be limited to 1000 words. The title should also be provided in Turkish for works submitted by Turkish authors or from Turkey. The title of the manuscripts submitted by foreign authors outside Turkey will not be translated into Turkish. Reviews prepared by authors with extensive knowledge on a particular field, which has been reflected in international literature by a high number of publications and citations, are evaluated. The authors may be invited by the Editors. A review should be prepared in the format describing, discussing and evaluating the current level of knowledge or topic that is to be used in the clinical practice and it should guide further studies. Abstract: It should be unstructured and not include subheadings and should be limited to 250 words. For reviews submitted by Turkish authors or from Turkey, Title, Abstract and Keywords should also be provided in Turkish. For reviews submitted by foreign authors outside Turkey, will not be translated into Turkish. Journal will accept case reports which are related to rare cases and conditions that constitute challenges in diagnosis and treatment, offer new methods or suggest knowledge not included in books, and are interesting and educational. It should be unstructured and not include subheadings and should be limited to 150 words. Main Text: It should include Introduction, Case Report, Discussion and Conclusion sections and should not exceed 1500 words excluding the abstract and references. References: The reference list should follow the main text and the number of references should be limited to 15. Figures and Images: They should be provided after the reference list according to their order of appearance in the text and should be limited to four.For manuscripts in English submitted by Turkish authors or from Turkey, Title, Structured Abstract and Keywords should also be provided in Turkish. However, translations of these sections for manuscripts submitted by foreign authors outside Turkey will be the responsibility of the Journal. Tables, Figures and Images: They should be provided after the main text according to their order of appearance in the text and should be limited to four. Main Text: It should not include subheadings and it should be limited to 1000 words. Journal Article: Ozcan KS, Bozyel S, Guler TE, Aksu T. Radiofrequency Catheter Ablation Therapy in The Treatment of Supraventricular Tachycardia: A Single Center Experience. Kocaeli Medical J 2017; 6: 54-8. Book: Jenkins PF. Making sense of the chest x-ray: a hands-on guide. New York: Oxford University Press; 2005. 194 p.
Book Chapter: Riffenburgh RH. Statistics in medicine. 2nd ed. Amsterdam (Netherlands): Elsevier Academic Press; c2006. Chapter 24, Regression and correlation methods; p. 447-86. Conference Paper: Rice AS, Farquhar-Smith WP, Bridges D, Brooks JW. Canabinoids and pain. In: Dostorovsky JO, Carr DB, Koltzenburg M, editors. Proceedings of the 10th World Congress on Pain; 2002 Aug 17-22; San Diego, CA. Seattle (WA): IASP Press; c2003. p. 437-68. Scientific or Technical Report: Page E, Harney JM. Health hazard evaluation report. Cincinnati (OH): National Institute for Occupational Safety and Health (US); 2001 Feb. 24 p. Report No. : HETA2000-0139-2824. Thesis: Kaplan SI. Jones DL. The role of physical activity on the need for revision total knee arthroplasty in individuals with osteoarthritis of the knee [dissertation]. [Pittsburgh (PA)]: University of Pittsburgh; 2001. 436 p.
Manuscripts accepted for publication but not published yet: Tian D, Araki H, Stahl E, Bergelson J, Kreitman M. Signature of balancing selection in Arabidopsis. Proc Natl Acad Sci U S A. Forthcoming 2002. NOTE: An example format for Tables can be requested from the Managing Editor before submission. It will increase the evaluation process. Decimal numbers used in text, tables and figures should be separated by commas in Turkish sections and by dots in English sections. The main text submitted to the journal must be in Turkish or English. Manuscripts written in other languages are not accepted. Citation potential is higher for manuscripts in English. The Managing Editor checks the conformity of the manuscript with the journal’s general guidelines before sending it to Editor. Then, Editor or Section Editors assigned by Editor will send the reviewers. Any manuscripts not prepared in accordance with the journal’s guidelines will be returned for revision. The initial evaluation period usually takes 30 days. If revision is requested, authors should submit their revised manuscripts within 21 days. Manuscripts and revisions should be submitted through the online manuscript submission system at the website http://kocaelimj.org/jvi.aspx. Manuscripts sent by e-mail will not be accepted. Manuscripts are evaluated in accordance with the principles of double-blinded peer review. Of the submitted manuscripts, those considered to be suitable are subjected to preliminary evaluation by the Managing Editor in terms of style, format, etc. and by the Editor in terms of their content. Manuscripts considered to be scientifically adequate are assigned to at least two reviewers. These reviewers are independent experts and members of the advisory board or who have published internationally on the topic of the manuscript. Research articles, systematic reviews and meta-analyses may be also evaluated by the Editor’s statistician counsellors in addition to peer review. When needed, the manuscripts may be scanned by the Managing Editor for determination of plagiarism and non-ethical situations. Also, all manuscripts are reviewed and edited for compliance with the rules of English grammar. All contributing authors of a manuscript accepted for publication are deemed to have accepted the right of editors to make corrections provided that no fundamental change is made to the basic meaning of the original text. Manuscripts not accorded priority for publication by the Editor, Associate Editors and Referees are rejected. The retraction requests of the manuscripts close to the final decision in evaluation process, without any reasonable explanation (not contrary to the Publication Ethics) is considered in the scope of rejection decision. Manuscripts that are not revised and resubmitted within the specified time and fail to notify the journal accordingly will be rejected. Once a manuscript is accepted for publication, addition to the author list, removal from the author list and order change cannot be effected. Manuscripts accepted for publication are prepared as ‘Epub ahead of print articles’ and published with an assigned DOI on the journal website http://kocaelimj.org/jvi.aspx. Information on the latest status of manuscripts submitted for evaluation and other information about the journal are available on the website http://kocaelimj.org/jvi.aspx. Contact details for the Managing Editor and the Editor are given below.